Have you been looking at your home thinking it needs a new paint job but don’t want to do it yourself and are not sure where to start. We suggest doing some research before scheduling any appointments. First talk to your family and friends- do they have a painter they like and trust? 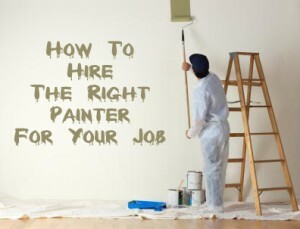 If not, here are three things to look for before hiring an Asheville Painting Contractor. Do they have insurance? we recommend that any contractor you hire should carry liability insurance and workers’ compensation if they have employees. This helps protect you if someone is injured while working on your property. We carry both $1 million in Liability and full workers’ compensation on all of our employees. Do they have use sub-contractors? A sub-contractor is an individual that signs a contract with a company to complete a portion or all of another contract. This basically means that the person or company you sign a contract with is not necessarily going to be doing the work. We hire employees who go through background checks, drug testing and reference checks prior to being employed with us. Do they give a warranty with their work and if so, how long is it valid for? Most paint companies will give a one year warranty on their work but may not cover both materials and labor. On residential re-paints we supply a 3 year warranty on both labor and materials. Lastly, don’t forget to get references and ask questions.